In January 2005, ExxonMobil presented this graph to institutional investors in New York. It shows oil production from existing fields now declining by 4-6% p.a. while demand increases by 1.7% p.a. 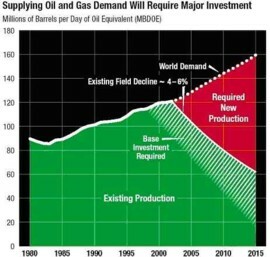 By 2020, required new oil production alone will have to equal total current global production to keep up with demand. One third of World Oil Production now comes from declining fields. Oil production has plateaued or is in decline in 33 of the 48 major oil producing nations including 6 of the 11 OPEC members. By 2030, production from today's oil fields will have fallen from 85Mb/d to 30Mb/d. "The World needs 10 new Saudi Arabias" - Sadad Al Husseini, Head of Exploration, Saudi Aramco. Analysis by ODAC of planned new oil field developments shows that after 2007, a seemingly unbridgeable gap opens up between oil demand and supply. There is a rapid drop off in new mega-project developments after 2006: by 2008 demand will become constrained by a supply which has fallen into decline. The latest analysis from the ASPO indicates that oil production may already have reached the Hubbert Peak or be about to do so. The graph below was presented at the first ASPO workshop in Uppsala in 2002. 90% of our transportation is dependent on oil. 66% of US oil consumption is used for transportation alone. Reducing the overwhelming reliance and dependence of our Road Transportation systems on fossil fuel must be the immediate priority. A Global Oil Consumption Reduction Programme must be implemented forthwith to conserve oil supplies and implement alternative sources of propulsion. This requirement to reduce oil dependence presents an enormous Market Opportunity for the alternative energy and alternative propulsion technology sectors. Those companies that position themselves now to take advantage of the forthcoming transition away from fossil fuel will achieve spectacular growth. There is one main technology available today that can reduce oil consumption sufficiently in the timescale required - the Plug-In Hybrid and the pure Battery Electric Vehicle. The Plug In Hybrid Electric Vehicle can offer 2 - 8 times the fuel economy of the Internal Combustion Engine Vehicle. The Battery Electric Vehicle (BEV) is some 10 times more energy efficient than the internal combustion engine. It is by far the most efficient form of road vehicle possible. The Solution to the Peak Oil situation is simple. To mandate that all new Light Vehicles sold must have a minimum fuel economy of 100 miles per US gallon. This efficiency is now being demonstrated by a growing US fleet of Toyota Priuses, retrofitted with larger plug in batteries. The Daihatsu UFE II and III Hybrid prototypes have demonstrated over 160mpg. The pure Battery EV demonstrates the greatest oil saving of all. Apart from that, the cost of running a BEV in Europe or the USA would be less than 10% of the cost of an Internal Combustion Engine Vehicle (ICEV). Less than 150 euros or dollars per year. With the latest battery technology, the BEV need no longer be subject to limited range but can be designed with a range comparable to petrol and diesel vehicles. With current technology, the Plug In Hybrid EV and the pure Battery EV can complement each other for different markets: the hybrid for assured longer range, the BEV for local and urban use. If we implement a program to convert as much road transportation to hybrid or pure electric power as possible, along with expansion in biofuels where possible and adoption of enhanced fuel efficiency technologies for the internal combustion engine, we will have a viable pathway to overcoming our dangerous dependence on fossil fuel and to reducing oil consumption to manageable levels. Conversion of Road Haulage and Public Transport to Electric Propulsion would have proportionately greater petroleum saving benefits and should be prioritised. Public Transport and Utility fleets could be converted to Electric Propulsion immediately with no inconvenience or change required in operating patterns. The total electricity required to power the whole UK road vehicle fleet by electric propulsion would be at most 15% of the electricity currently generated in the UK. Compared with the 29 billion litres of fuel sold in the UK in 2001, it is clear how much more efficient and less polluting Electric Propulsion would be. Studies indicate that at least 20% of the German car fleet could be converted to electric power for no penalty; they could be recharged overnight from off peak capacity that is currently unused. In the Netherlands, the percentage of the car fleet that could be powered by unused off-peak capacity was put at 20-60%. We have a ready made buffer already existing that can be used to reduce petroleum consumption. Load levelling to reduce the differences between peak and off-peak demand is of major importance for efficient electricity generation. An EV fleet that recharges overnight from off peak electricity would be of major benefit to central electricity generating stations. The official electricity transmission losses alone in the UK would power about 10% of the whole UK road vehicle fleet. Technology exists to reduce these losses still further. In the USA, the American Council for an Energy Efficient Economy estimate that 24% of current US electricity consumption could be easily saved. If this saving was applied exclusively to power the US Light Vehicle Fleet, US car drivers could drive 33% further than they do today, replace all their petrol with electricity and need generate no more electricity than they do today. 9.1Mb/d of oil would be saved. Therefore any requirement to build new electricity generating capacity to power an EV fleet can be minimised: renewable energy and CHP would be the most efficient ways to supply this. 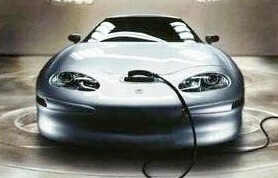 The GM EV1 is the only dedicated Electric Car design to have entered series production in recent times. With modern NaNiCl batteries, its range between recharging could be more than doubled to 300 miles. Like all the EVs introduced in minimal numbers in the late 1990s to meet the CARB rules, the 2 seater EV1 was handicapped by lack of marketing and a prohibitive price - $500 per month for the improved 1999 version. In 2005, General Motors crushed most of the EV1s that were manufactured and removed it from the Smithsonian Museum. The EV1 was the most aerodynamically efficient car ever produced.